Make easy changes to the Excel status bar, and macros too, in this week's Excel news. Visit my Excel website for more tips, tutorials and videos, and check the index for past issues of this newsletter. Do you customize the Excel status bar, or leave it with the default settings? Num Lock used to be on the Status Bar by default (2003? ), but now it's not, so I customized by Status Bar, to show that setting, and a few others. This Microsoft article shows the list of options, and which ones are selected by default. Click on an option, to turn it on or off. I also turned on the Numerical Count option, to see how many numbers are selected. The Count option counts all kinds of data, including text. You can add your own messages to the Status Bar too, such as a progress message for macros, or a function that does subtraction for two selected ranges. There are lots of sample macros on my website and blogs, and there are instructions on how to copy them into your workbook, if you aren't sure how to do that. Free Webinar: If you want to learn more about Excel macros, Jon Acampora is running free webinars this week that shows you how to get started with Excel macros, and save time on some of your tasks. There's a full course too - VBA Pro - if you decide to learn even more about Excel programming. There's still a bit of snow in our yard, but we can make it look like spring indoors. 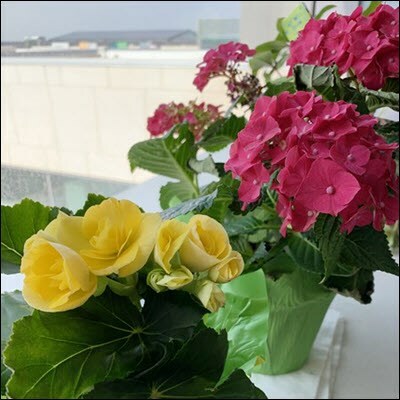 My mom is in the hospital, and she's received several lovely flowering plants, to brighten up her windowsill. I think the pink flower is a hydrangea, and the yellow one is a Begonia - but I've been wrong before! P. S. We're spending lots of time with Mom, so there could be delays in my email replies. Thanks for your patience!